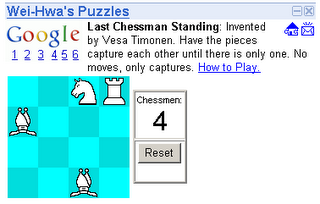 Last Chessman Standing: Invented by Vesa Timonen. Have the pieces capture each other until there is only one. No moves, only captures. Click and drag a piece onto another to capture it. Pieces capture as in standard chess, but color can be ignored. When the button is held on a piece, the legal captures will turn black. You'll be notified if there are no more moves. Answers / Solutions: Answers are usually (and will be) posted in the comments section. Full answers will be posted on the solve puzzles page.